The team at Bathroom Place prides itself on providing you with quality bathroom features on the cutting edge of modern design. Since 2001, we have created, built and sold collections that represent what you want most out of your bathroom. When you come to us, you’re able to find everything you need to design the bathroom of your dreams. This month, we’re happy to feature our newest creation the Adams Collection. It has a clean-cut design like our other collections but provides you with more versatility than ever before. 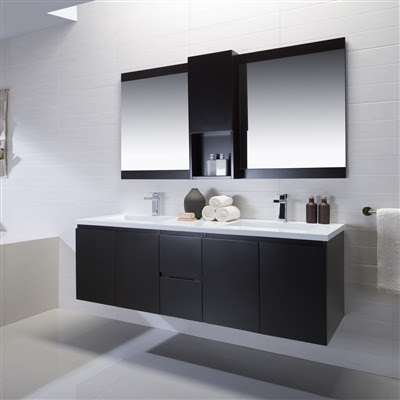 Choose from modern vanities with one or two sinks as well as a variety of bathroom mirror options. Each vanity comes with our new seamless solid surface countertop, which provides you with ample room for your bathroom essentials. It’s smooth to the touch and provides the ideal, minimalist look you want in a modern bathroom. The countertop is a non-porous low-maintenance material that’s stain resistant, made of 38% polyester resin and 60% aluminum hydroxide powder. It’s slightly thicker than our other countertops at 1.25 inches. Further, it’s made of a solid cast instead of combined solid surface sheets and can resist high temperatures up to 212 degrees. Bottom line, this countertop is built to last. Additionally, on the outside, the cabinets in the Adams Collection give you the sleek, float-in-the-air look you want, while on the inside, there’s plenty of space and hidden drawers to organize all your bathroom items. It’s the best of both worlds for the modern bathroom design. In this collection, you’re able to customize your bathroom furniture in a number ways. We offer three different cabinet colors as well as two different sizes of countertops for the double vanities. We also have a handful of mirror options, including frameless and mirrors with wooden sides. 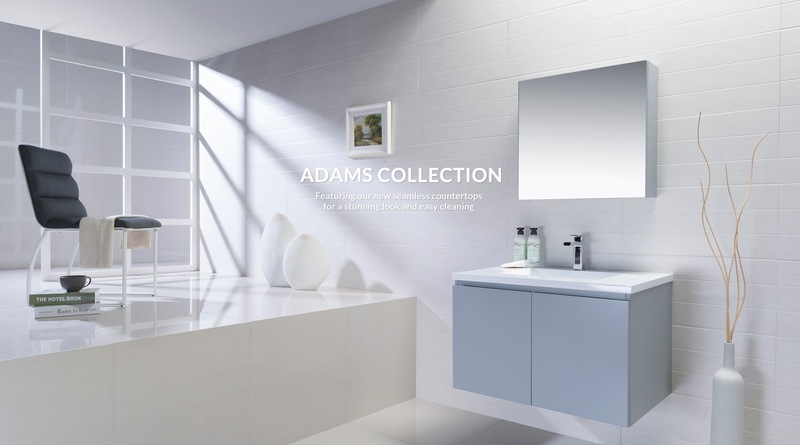 Overall, the Adams Collection seamlessly combines functionality with beauty. Browse online or come into one of our three Miami-area locations to see if the Adams Collection is right for your home. Our team of experts is happy answer any questions you may or to help choose the best combinations for you.